Scientists have discovered our gut bacteria can determine factors like weight, along with energy balance and our perception of stress. In fact, we now know the state of our gut in conjunction with the type of gut bacteria we have, can influence how we store fat, (especially around the tummy), how easily we’re able to maintain weight, our insulin levels and consequently how predisposed we are to anxiety, stress and happiness. We know about the two major bacteria strains, Lactobacillus and Bifidobacterium – common in probiotics and fermented/ cultured food like sauerkraut, kombucha and kimchi – but what we have now determined are certain bacteria that actually aid in weight loss, prevent diabetes and auto immune conditions. For example, one of the most populated bacteria strains, called Akkermansia muciniphila, or A. muciniphila, was found in 2004, and have been proven to improve metabolic conditions associated with obesity, diabetes, liver diseases, and heart-related diseases. Scientists also found that people with a lot of excess body fat, high BMI along with other health complications had a severely lower level of that particular bacteria strain compared to healthier people. One human study found people with higher amounts of A. muciniphila bacteria lost more tummy fat compared with those with low amounts, but also had better blood sugar levels and insulin sensitivity, translating to lower risk of diabetes, obesity and auto-immune issues. The bottom line? The more of this bacteria strain in your gut, the easier it is to stay lean and the healthier you are. 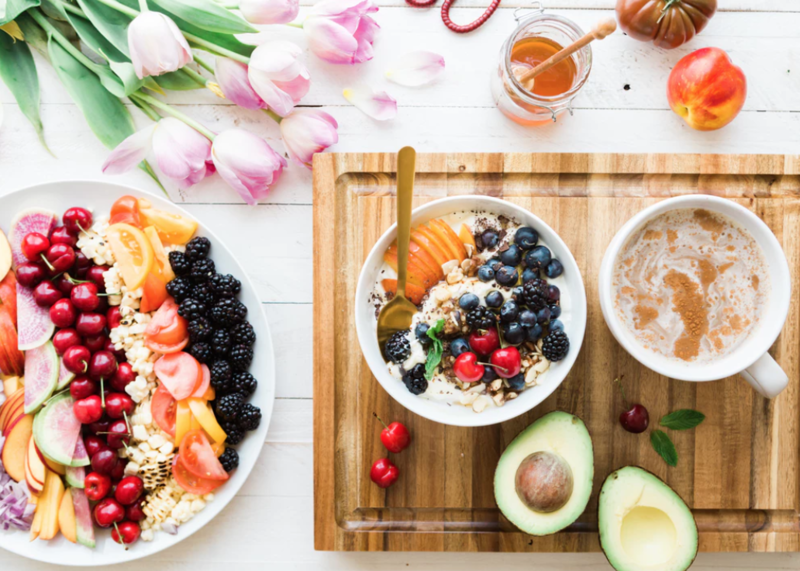 It’s a cyclical thing, the healthier your gut, the easier it is to keep healthy and lean – which in turn makes it easier to stay healthy, lean and maintain a healthy weight in the first place. How do you get more of the good ‘lean gut bacteria’ into your gut? If you don’t do anything else, this is the number one thing you can do for a healthy gut. Don’t be fooled by “healthy” sugar alternatives like agave nectar or artificial sweeteners, which actually stimulate appetite and are linked to cancer and obesity. Try stevia or xylitol for a low calorie option which don’t increase your blood sugar levels after consumption, but sparingly! These imbalance your gut and create inflammation in the gut lining. If you want to learn about the exact foods to eat and avoid, I go into this in more depth in my Gut Masterclass (free – but limited to first 15 people to register here), where you’ll also learn the top foods to eat and how to eliminate inflammation. Some of these will surprise you. 3. Eat a variety of whole foods, carbs included! Eating a mostly plant based varied diet will boost the right strain of gut bacteria. The typical Western diet is extremely low in the right type of foods that feed our gut bacteria, which causes the gut microbiomes to starve, resulting in an imbalanced gut with increased risk of of inflammatory diseases and colon cancer as well as metabolic issues, type 2 diabetes, cardiovascular disease and weight gain. Cultured and fermented foods rich in probiotics support healthy gut flora but they have histamines, so are not beneficial for everyone. There are also certain polyphenol rich foods that are beneficial to some people, but detrimental to others. This is an individualised approach and specific to you and where you’re at. Book your free Gut Assessment to get your next steps unique to your situation. 4. Consume more prebiotic-rich foods. Prebiotics are nondigestible fibers found in certain foods, that your gut bacteria feed on. Just some foods rich in these are Jerusalem artichoke, asparagus, garlic and onion. 5. Manage your movement, mindset and stress levels. Scientists have confirmed the strong connection between our gut and our brain. When we experience stress, this information gets channeled down to our gut by our stress modulators that control our HPA axis which can then become inflamed, leaving you with gut symptoms, anxiety, depression, low energy and brain fog. Supporting a healthy gut with the right foods and lifestyle factors can dramatically give you a happy healthy mind and body, a lot of energy, clarity and satisfaction. Register for my FREE Gut Brain Masterclass, where you’ll uncover the best nutritional approach for good gut health PLUS the two hidden secrets you NEED to master to get rid of your gut symptoms for GOOD. Want to get more specific with your gut health? Book your Gut Assessment (free if you book before Sunday 8th April), which will clarify your next steps.